Guaidó, anointed by Trump and a new Iraq-style Coalition of the Willing, did not even run in Venezuela’s May 2018 presidential election. In fact, shortly before the election, Guaidó was not even mentioned by the opposition-aligned pollster Datanálisis when it published approval ratings of various prominent opposition leaders. Henri Falcón, who actually did run in the election (defying US threats against him) was claimed by the pollster to basically be in a statistical tie for most popular among them. It is remarkable to see the Western media dismiss this election as “fraudulent,” without even attempting to show that it was “stolen“ from Falcón. Perhaps that’s because it so clearly wasn’t stolen. 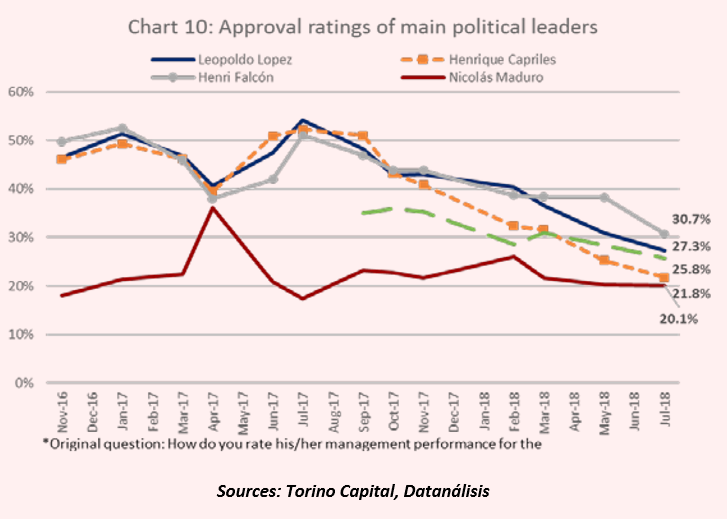 Data from the opposition-aligned pollsters in Venezuela (via Torino Capital) indicates that Henri Falcón was the most popular of the major opposition figures at the time of the May 2018 presidential election. Nicolás Maduro won the election due to widespread opposition boycotting and votes drawn by another opposition candidate, Javier Bertucci. The constitutional argument that Trump and his accomplices have used to “recognize” Guaidó rests on the preposterous claim that Maduro has “abandoned” the presidency by soundly beating Falcón in the election. Caracas-based journalist Lucas Koerner took apart that argument in more detail. 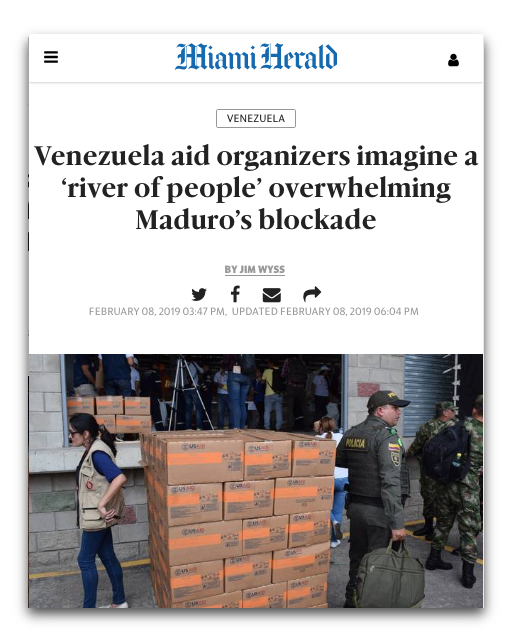 The Miami Herald headline (2/8/19) blames food shortages in Venezuela on “Maduro’s blockade,” not on US-led sanctions. What about the McClatchy-owned Herald‘s claim that Maduro “continues to reject international aid”? In November 2018, following a public appeal by Maduro, the UN did authorize emergency aid for Venezuela. It was even reported by Reuters (11/26/18), whose headlines have often broadcast the news agency’s contempt for Maduro’s government. It’s not unusual for Western media to ignore facts they have themselves reported when a major “propaganda blitz” by Washington is underway against a government. For example, it was generally reported accurately in 1998 that UN weapons inspectors were withdrawn from Iraq ahead of air strikes ordered by Bill Clinton, not expelled by Iraq’s government. But by 2002, it became a staple of pro-war propaganda that Iraq had expelled weapons inspectors (Extra! Update, 10/02). And, incidentally, when a Venezuelan NGO requested aid from the UN-linked Global Fund in 2017, it was turned down. Setting aside how effective foreign aid is at all (the example of Haiti hardly makes a great case for it), it is supposed to be distributed based on relative need, not based on how badly the US government wants somebody overthrown. But the potential for “aid” to alleviate Venezuela’s crisis is negligible compared to the destructive impact of US economic sanctions. Near the end of Wyss’ article, he cited an estimate from the thoroughly demonized Venezuelan government that US sanctions have cost it $30 billion, with no time period specified for that estimate. Again, this calls to mind the run-up to the Iraq invasion, when completely factual statements that Iraq had no WMDs were attributed to the discredited Iraqi government. Quoting Iraqi denials supposedly balanced the lies spread in the media by US officials like John Bolton, who now leads the charge to overthrow Maduro. Wyss could have cited economists independent of the Maduro government on the impact of US sanctions—like US economist Mark Weisbrot, or the emphatically anti-Maduro Venezuelan economist Francisco Rodríguez. Illegal US sanctions were first imposed in 2015 under a fraudulent “state of emergency” declared by Obama, and subsequently extended by Trump. The revenue lost to Venezuela’s government due to US economic sanctions since August 2017, when the impact became very easy to quantify, is by now well over $6 billion. That’s enormous in an economy that was only able to import about $11 billion of goods in 2018, and needs about $2 billion per year in medicines. Trump’s “recognition” of Guaidó as “interim president” was the pretext for making the already devastating sanctions much worse. Last month, Francisco Rodríguez revised his projection for the change in Venezuela’s real GDP in 2019, from an 11 percent contraction to 26 percent, after the intensified sanctions were announced. The $20 million in US “aid” that Wyss is outraged Maduro won’t let in is a rounding error compared to the billions already lost from Trump’s sanctions. And if we can do something that will bring that end quicker, we probably should do it, but we should do it understanding that it’s going to have an impact on millions and millions of people who are already having great difficulty finding enough to eat, getting themselves cured when they get sick, or finding clothes to put on their children before they go off to school. We don’t get to do this and pretend as though it has no impact there. We have to make the hard decision—the desired outcome justifies this fairly severe punishment. How does this gruesome candor get missed by reporters like Wyss, and go unreported in his article? Speaking of “severe punishment,” if the names John Bolton and Elliott Abrams don’t immediately call to mind the punishment they should be receiving for crimes against humanity, it illustrates how well the Western propaganda system functions. Bolton, a prime facilitator of the Iraq War, recently suggested that Maduro could be sent to a US-run torture camp in Cuba. Abrams played a key role in keeping US support flowing to mass murderers and torturers in Central America during the 1980s. Also significant that Abrams, brought in by Trump to help oust Maduro, used “humanitarian aid” as cover to supply weapons to the US-backed Contra terrorists in Nicaragua. Calling for international aid and being democratically elected will do as little to protect Maduro’s government from US aggression as being disarmed of WMD did to prevent Iraq from being invaded—unless there is much more pushback from the US public against a lethal propaganda system. NY Times today describes credible accounts that Cuban doctors were directed by Maduro’s government to withhold healthcare from Venezuelans who didn’t support Maduro. Joe, did you ever think you would advocate for a government like that? Search your conscience. Did Venezuela’s President Really ‘Steal’ the 2018 Election from an Unknown Who Didn’t Run? Was that the Onion or Reuters Quoting Mike Pompeo on Venezuela?